Kerlink has been recognized in Forbes Futur 40 2017 ranking. 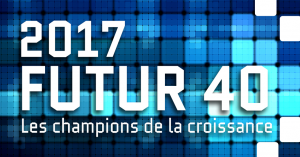 Thorigne-Fouillard, France – July 27th 2017, 06:00 PM CET – Kerlink (ALKLK – FR0013156007), a specialist and global leader in network solutions dedicated to the Internet of Things (IoT), has been recognized in Forbes Futur 40 2017 ranking. This award recognizes the 40 non-financial SMEs listed in Paris which have shown the strongest growth in their turnover over the last three years and whose business model is innovative. Based on the financial information provided by Morningstar, and in partnership with the Federation of Individual Investors and Clubs (F2IC), PME Finance and Paris Europlace, Forbes France has chosen to highlight Kerlink during this 3rd edition of Forbes Future 40, the results of which were proclaimed on July 13th. Listed on Paris Euronext Growth stock exchange since May 2016, Kerlink enjoys a very sustained development of its business with a turnover of € 14.1 million in 2016, showing an increase of 90% last year and a Compound Annual Growth Rate (CAGR) of 57% over the last four years. The Internet of Things international market is expanding quickly, and this strong growth is boosted by public and private operators currently starting massive IoT networks deployment based on solutions provided by the Group. To take advantage of this opportunity and accelerate its growth, Kerlink opened offices in Asia (Kerlink Singapore) last year, and in North America (Kerlink Inc., Chicago) earlier this year. William Gouesbet, Chairman and CEO of KERLINK said: ” We are proud and honored to receive this award, especially recognizing the growth of our Group for several years. The steady progression of our results is a direct reflection of our constant commitment to develop a customer-centric and a sustained innovation approach in order to offer a unique service based on the reliability of our solutions and the professionalism of our teams. This dynamism, which is instilled on a daily basis and driven by the deployment of major contracts with leading international operators, reinforces the current economic performance, and augurs well for the development of our Group “.